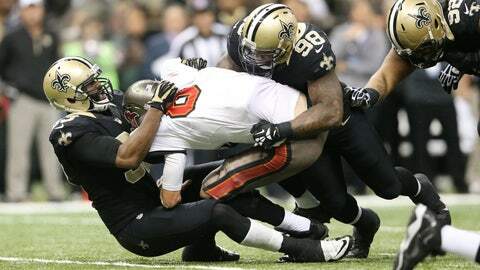 Tampa Bay Buccaneers quarterback Mike Glennon (8) is sacked by New Orleans Saints outside linebacker Junior Galette (left) and outside linebacker Parys Haralson (98) in the second half. It’s over. This Tampa Bay Buccaneers season, at times strange and intriguing, other times silly, is through. Looking for a silver lining? That’s one fit to ring in 2014 happy. Indeed, let this old acquaintance be forgot. The Bucs close their 2013 roller-coaster at 4-12, matching the record of Raheem Morris’ last stand two years ago. Will this be Greg Schiano’s swan song as well? An answer remains cloudy. Buccaneers can't slow down Drew Brees in a season-ending loss on the road to the Saints. Whatever the future holds, this final chapter ended in predictable fashion, with a blowout loss to the New Orleans Saints on Sunday at the Mercedes-Benz Superdome. Anyone who has watched the Bucs more than a quarter this month knew leaving the Big Easy with an upset would be a monumental task. 1. The Saints turned this into a track meet in a hurry. Drew Brees was a surgeon. He completed 24 of 31 passes for 381 yards with four touchdowns. New Orleans burned through 468 yards, a season-high for a Tampa Bay opponent. This was a much different offense than the one the Bucs bottled up in Week 2. That day, the Saints were held to 16 points. Brees got his numbers — he threw for 322 yards with one touchdown — but he was less of a lightning bolt than what he showed this Sunday. With a playoff berth at stake for the Saints, in the building where they become a tidal wave, anyone who tracks the Bucs knew this could turn ugly. It took a little longer than expected — Tampa Bay was breathing early in the third quarter — but the outcome was predictable. 2. Mike Glennon had some good moments. Despite the final score, there were some things to like from the rookie. He showed deep-ball accuracy in a 48-yard touchdown pass to Tiquan Underwood in the first quarter. He seemed comfortable throwing to Underwood, Tim Wright and Vincent Jackson — his main targets on a day when he finished 22-of-41 passing for 219 yards with two touchdowns and one interception. Where was this last week in St. Louis, where the Bucs sputtered to a measly 170 yards? Certainly, Glennon’s not good enough to win a shootout with Brees. He was far from spotless. At times, though, he looked more effective than he had most of December. 3. No Bobby Rainey impact, no chance. Again, Rainey was a non-factor, and that meant bad things for the Bucs. Rainey has an admirable backstory, but his 11-carry, 35-yard effort meant he was held to fewer than 40 yards for the third consecutive game. The Saints were vulnerable against the run. The Bucs gashed them for 160 yards rushing in Week 2, led by Doug Martin’s 144. New Orleans entered 19th in the league in rush defense, allowing 114.1 yards per game. This day, the Bucs produced 75 yards on the ground. This was an opportunity lost. Tampa Bay was at its best this season when its running game clicked. By the end, though, its ground threat ended with a thud. If there’s one culprit for why this unit was so toothless in December, this is it. 4. What were the Bucs thinking on that fake field goal — or whatever it was? Late in the second quarter, trailing 28-14, the Bucs had a manageable 42-yard field goal attempt after an impressive 54-yard march. Instead, Tampa Bay chose to squander the chance by calling a fake that fooled absolutely no one. The embarrassing sequence ended with punter Michael Koenen heaving a weak attempt near the sideline. There’s a fine line between aggression and crazy. The Bucs’ flea flicker on their first touchdown was smart, admirable and well-executed. This play was the flip side. A head-scratcher, for sure. 5. Who knows what comes next? This rout was no surprise. A decision about Schiano’s future is too important for this result in the Saints’ lion den to loom too large. Really, how much of a difference is there between 4-12 and 5-11? It’s like choosing between one or two black eyes. So we’ll wait and see what happens Monday or beyond. There’s a case to be made for keeping Schiano: Glennon, at times, showed promise after Josh Freeman became invisible in Minnesota, and a 4-1 run after the 0-8 start was notable. There’s also a case to be made against Schiano: September and October were nightmares, and Glennon struggled in December (four touchdowns and four interceptions) before a so-so showing in the finale. The Bucs went 1-4 this month. Of course, there are rumors about Penn State’s interest in Schiano if Bill O’Brien bolts for the Houston Texans. But it’s hard to figure out why Schiano would leave if the Glazers want him back. The season’s over, the drama’s not. A weird, wild year.